Bubbles, Booms, and Busts: Will it Happen to Biotech? In the end of 20th century, with the advent of internet, the world expected a great increase in productivity due to its potential in improving the flow of information, goods and service. Hence the great dot.com bubble. 20 years later, today in 2018, internet has changed the world. And we just experienced another bubble with bitcoin and blockchain. Will this boom and bubble cycle ever happen to biotech someday in the near future? This is not a fair review. I only read 10% till section 1.6. Role of the media in fueling the boom. After that, Dr. Rapp started to talk about politics, money and fiscal policy. I decided to put this book down. New technology: 1920s (automobiles, highways and electrification), 1990s (internet). Developing new areas with favorable features: Florida. 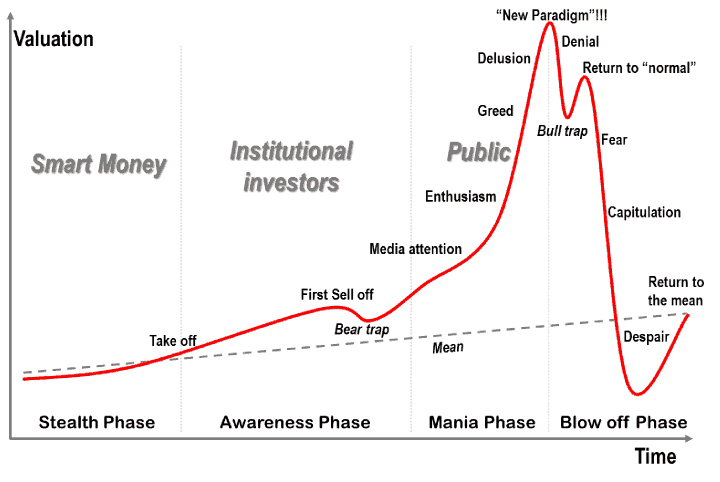 A biotech bubble would fit into the first category. With the advent of cheap genetic information, human genome project, faster and more efficient research and development pace, will we see a flood of new drugs in the next decade? This is so-called the dawning of the age of biology. See: Golden Age of Drug Development by RTW Investments. That’s on a sector scale. On a smaller scale, I am pretty sure we will see lots of boom, bubble and bust cycles in certains fields (such as stem cell, CRISPR, microbiome, etc.) or certain companies. Watch out when you see it. Eventually more and more patients can benefit from the investment then advance of biotechnology, regardless of any bubble or not. Just like how internet has changed the world two decades after the legendary dot.com bubble.